/etc/selinux/<policy_name>/modules - This is the default for systems that support versions < 2.4 of libsemanage, libsepol, and policycoreutils. Note: There can be multiple policy stores on a system at /etc/selinux/<policy_name>/modules. The Policy Store files are either installed, updated or built by the semodule(8) and semanage(8) commands as a part of the build process. The resulting files will either be copied over to the Policy Configuration Files area, or used to rebuild the kernel binary policy located at /etc/selinux/<policy_name>/policy. All files may have comments inserted where each line must have the '#' symbol to indicate the start of a comment. The command options and outputs shown in the text are based on the current F-20 build. This is the packaged base policy that contains the mandatory modules and policy components such as object classes, permission declarations and initial SIDs. This is only present if the save-linked is set to TRUE as described in the /etc/selinux/semanage.conf section. It contains the modules that have been linked using the semodule_link(8) command. This is a binary file used by libsemanage for managing updates to the store. The format is not relevant to policy construction. This contains a copy all the modules 'Labeling Policy File' entries (e.g. the <module_name>.fc files) that have been extracted from the base.pp and the loadable modules in the modules/active/modules directory. homedir_template file that will be used to produce the file_contexts.homedirs file which will then become the policies ./contexts/files/file_contexts.homedirs file. file_contexts file that will become the policies file_contexts file. Note that as a part of the semanage build process, these two files will also have file_contexts.bin and file_contexts.homedirs.bin files present in the Policy Configuration Files contexts/files directory. This is because semanage requires these in the Perl compatible regular expression (PCRE) internal format. They are generated by the sefcontext_compile(8) utility. homedir_template - Any line in the file_contexts.template file that has the keywords HOME_ROOT, HOME_DIR and/or USER are extracted and added to the homedir_template file. This is because these keywords are used to identify entries that are associated to a users home directory area. These lines may also have the ROLE keyword declared. The homedir_template file will then be processed by genhomedircon(8) to generate individual SELinux user entries in the file_contexts.homedirs file as discussed in the modules/active/file_contexts.homedirs section. file_contexts - All other lines are extracted and added to the file_contexts file as they are files not associated to a users home directory. pathname_regexp An entry that defines the pathname that may be in the form of a regular expression. The metacharacters '^' (match beginning of line) and '$' (match end of line) are automatically added to the expression by the routines that process this file, however they can be over-ridden by using '. *' at either the beginning or end of the expression (see the example file_contexts files below). There are also keywords of HOME_ROOT, HOME_DIR, ROLE and USER that are used by file labeling commands (see the keyword definitions below and the modules/active/homedir_template file section for their usage). By convention this entry is known as 'file type', however it really represents the 'file object class'. The security context, including the MLS / MCS level or range if applicable that will be assigned to the file. A value of <<none>> can be used to indicate that matching files should not be re-labeled. HOME_ROOT This keyword is replaced by the GNU / Linux users root home directory, normally '/home' is the default. HOME_DIR This keyword is replaced by the GNU / Linux users home directory, normally '/home/' is the default. USER This keyword will be replaced by the users GNU / Linux user id. It is used for files and directories within the users home directory area. # used to manage user home directory entries. This file becomes the policies contexts/files/file_contexts file and is built from entries in the modules/active/file_contexts.template file as explained above and shown in the File Context Configuration Files diagram. It is then used by the file labeling utilities to ensure that files and directories are labeled according to the policy. The format of the file_contexts file is the same as the modules/active/file_contexts.template file. The USER keyword is replaced by the users GNU / Linux user id when the file labeling utilities are run. # been taken from the targeted policy. # removed and put in the homedir_template file. # contexts/files/file_contexts - Sample entries from the MLS reference policy. # information used by trusted applications. 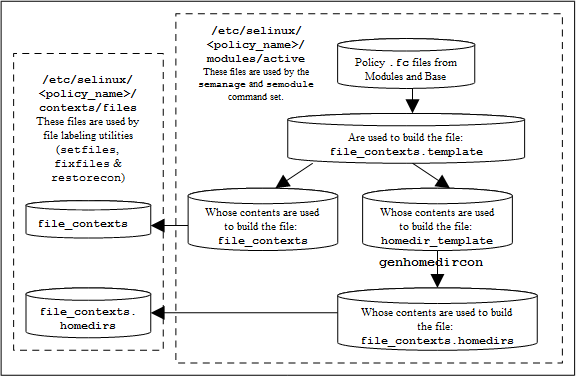 This file is built from entries in the [[#modules/active/file_contexts.template | file_contexts.template]] file (as shown in the [http://selinuxproject.org/~rhaines/NB4-diagrams/25-file_contexts.png File Context Configuration Files] diagram) and explained in the [[#modules/modules/active/file_contexts.template | modules/active/file_contexts.template]] section. The file is used by genhomedircon, semanage login or semanage user to generate individual user entries in the [[#modules/active/file_contexts.homedirs | file_contexts.homedirs]] file. The homedir_template file has the same per line format as the [[#modules/active/file_contexts.template | modules/active/file_contexts.template]] file. This file becomes the policies contexts/files/file_contexts.homedirs file when building policy as shown in the File Context Configuration Files diagram. It is then used by the file labeling utilities to ensure that users home directory areas are labeled according to the policy. The file can be built by the genhomedircon command (that just calls /usr/sbin/semodule -Bn) or if using semanage with user or login options to manage users, where it is called automatically as it is now a libsepol library function. The file_contexts.homedirs file has the same per line format as the modules/active/file_contexts.template file, however the HOME_DIR, ROOT_DIR, ROLE and USER keywords will be replaced as explained in the keyword definitions section above. # by entries as explained above. These files are not used at present. There is code to produce a netfilter_contexts file for use by the GNU/Linux iptables service in the Reference Policy that would generate a file similar to the example below, however there seems much debate on how they should be managed (see bug 201573 - Secmark iptables integration for details). This is the binary policy file built by either the semanage(8) or semodule(8) commands (depending on the configuration action), that then becomes the binary policy to be loaded into the kernel. The seusers file would be extracted by the subsequent semodule command when building the policy to produce the seusers.final file. This action will update the seusers file that would then be used to produce the seusers.final file with both policy and locally defined user mapping. user_id Where user_id is the GNU / Linux user identity. If this is a GNU / Linux group_id then it will be preceded with the '%' sign as shown in the example below. seuser_id The SELinux user identity. range The optional level or range. The users_extra and users_extra.local files are used to map a prefix to users home directories as discussed in the modules/active/file_contexts.template file section, where it is used to replace the ROLE keyword. The prefix is linked to an SELinux user id and should reflect the users role. The semanage user command will allow a prefix to be added via the -P flag (although no longer used by policies as discussed in the modules/active/file_contexts.template file section). The users_extra file contains all the policy prefix entries, and the users_extra.local file contains those generated by the semanage user command. The users_extra file would then be extracted by a subsequent semodule command when building the policy. The users.local file is used to add new SELinux users to the policy without editing the policy source itself (with each line in the file following a policy language user statement section). This is useful when only the Reference Policy headers are installed and additional users need to added. The semanage user command will allow a new SELinux user to be added that would generate the user.local file and if a -P flag has been specified, then a users_extra.local file is also updated (note: if this is a new SELinux user and a prefix is not specified a default prefix of user is generated). Define the format and show example users_extra and users_extra.local files. Execute an semanage user command that will add a new SELinux user and associated prefix, and show the resulting users_extra, users_extra.local and users.local files. Note that each line of the users.local file contains a user statement that is defined in the policy language user statement section, and will be built into the policy via the semanage command. prefix_id An identifier that will be used to replace the ROLE keyword within the modules/active/homedir_template file when building the ./modules/active/file_contexts.homedirs file for the relabeling utilities to set the security context on users home directories. # the semanage user command. This file is created and updated by the semanage boolean command and holds boolean value as requested. This file is created and updated by the semanage fcontext command. It is used to hold file context information on files and directories that were not delivered by the core policy (i.e. they are not defined in any of the *.fc files delivered in the base and loadable modules). The semanage command will add the information to the policy stores file_contexts.local file and then copy this file to the ./contexts/files/file_contexts.local file, where it will be used when the file context utilities are run. The format of the file_contexts.local file is the same as the modules/active/file_contexts.template file. # otherwise the command will fail. This file is created and updated by the semanage interface command to hold network interface information that was not delivered by the core policy (i.e. they are not defined in base.conf file). The new interface information is then built into the policy by the semanage(8) command. Each line of the file contains a netifcon statement that is defined along with examples in the netifcon statement section. This file is created and updated by the semanage node command to hold network address information that was not delivered by the core policy (i.e. they are not defined in base.conf file). The new node information is then built into the policy by the semanage(8) command. Each line of the file contains a nodecon statement that is defined along with examples in the policy language nodecon statement section. This file is created and updated by the semanage port command to hold network port information that was not delivered by the core policy (i.e. they are not defined in base.conf file). The new port information is then built into the policy by the semanage(8) command. Each line of the file contains a portcon statement that is defined along with examples in the policy language portcon statement section. This file will only exist if the policy build specified that tunables should be preserved, if so they would be converted to booleans by the policy build process. This file will only exist if the policy build specified that dontaudit rules should be disabled. The modules within the policy store may be compressed or not depending on the value of the bzip-blocksize parameter in the semanage.conf file. The modules and their status can be listed using the semanage module -l command as shown below. ↑ The genhomedircon command has now been built into the libsemanage library as a function to build the file_contexts.homedirs file via semanage(8). ↑ This uses SECMARK labeling that has been utilised by SELinux as described in the SELinux Networking Support section. ↑ Many seusers make confusion: The modules/active/seusers file is used to hold initial seusers entries, the modules/active/seusers.final file holds the complete entries that then becomes the policy seusers file. ↑ The Reference Policy Makefile 'Rules.modular' script uses this method to install the initial seusers file. ↑ The Reference Policy Makefile 'Rules.modular' script uses this method to install the initial users_extra file. This page was last modified on 25 September 2015, at 14:28. This page has been accessed 93,250 times.